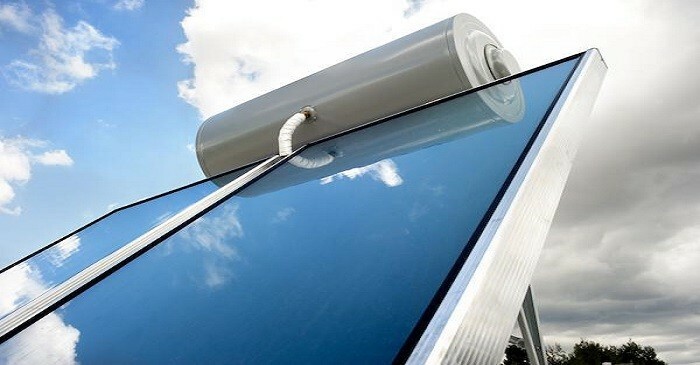 Solar water heating uses the power of solar energy to warm water. This is done by converting sunlight into renewable energy for water heating through the use of a solar thermal collector. The uses of several of these technologies are now being used increasingly worldwide. In ‘close-coupled’ solar water heating systems the storage tanks are horizontally seated above the solar collectors on the roof. No pumping is actually needed as the hot water naturally rises into the tank through the thermosiphon flow. In a ‘pump-circulated’ system, the storage tank is usually ground or floor mounted and tends to be below the level of the collectors. Circulating pumps can move either water or transfer fluid between the tanks and collectors. To heat water using solar energy, a collector, is often fastened to the roof or wall that is directly facing the sun. This then heats a working fluid that is either pumped (active system) or driven by natural convection (passive system) through it. A collector can be made from simple glass-topped insulated boxes which have a flat solar absorber made from a sheet of metal. This is attached to copper heat exchanger pipes and metal tubes surrounded by an evacuated glass cylinder. Solar water heating panels usually cost between £3,000 and £5,000, which can save you around £65 to £125 a year on heating costs alone. Solar water heating systems are designed to give you hot water for the duration of the year. However, when it comes to winter there may not be sufficient solar heat gain to deliver the hot water. In cases like this, a gas or electric booster is required to heat the water instead. Water that is heated by the sun can be used in many different ways. Whilst it is most commonly known for being used within residential setting providing domestic hot water, it does have use in industrial applications, such as generating electricity. Although the use of this energy is becoming increasingly popular world wide the design of it makes it more effective in warmer climates. The hotter climates make the technology cheaper as the payback time is a lot faster. Perhaps this is why the global solar thermal market is said to be predominately controlled by China, Europe, Japan and India. The Renewable Heat Incentive (RHI) is a government scheme whereby consumers are paid a certain amount for generating heat via using renewable energy. However, to qualify for the RHI, your home must be able to fit the set energy efficient standards. It is recommended for consumers to make sure that their home is as energy efficient as possible and then think about what type of renewable energy technology they would like. BP, SOCAR sign deal to build new Azeri oil exploration..
Oil market likely to be well balanced in 2019, says.. Exclusive: Spain's Repsol suspended swap deal for.. Exclusive: Venezuela skirts U.S. sanctions by funneling..
Automakers invest heavily in electric vehicles despite.. Exclusive: Venezuela skirts U.S. sanctions by..
Studies find solar contribution may increase in EU green.. Pioneering Projects in Solar-Powered Electric Vehicles and.. Global growth decouple from the growth in energy demand -..
Drop in installation price and subsidies to drive solar PVs..